Its no secret that Alice Through the Looking Glass has not met up to fan’s expectations. This past weekend when the film debuted, it very clearly and decidedly lost out to X-Men: Apocalypse. As the Mad Hatter himself might say, this movie has lost its muchness. However, in between the jumble of hectic plot, there were some moments of a redeeming nature. This Alice in Wonderland sequel isn’t all bad, but it certainly could have done with more of Tim Burton’s style of weird darkness. Alice is back once more to save Underland and her friend. Alice Through the Looking Glass finds our young heroine on the tail end of the previous film, sailing her father’s ship out to find adventure. Alice (Mia Wasikowska) has certainly grown into a more confident self as a ship’s captain and shows off her creativity and bravery within the very first scene. However, when she returns home, she finds that Haymitch has taken over his father’s company and is planning on taking Alice’s ship by force. As Alice wonders what to do next, she sees one of her old friends from Underland and is thrust back into that fantastical world. Alice must help the Mad Hatter (Johnny Depp) find his family by traveling back in time and learning about his past before it is too late to save him. 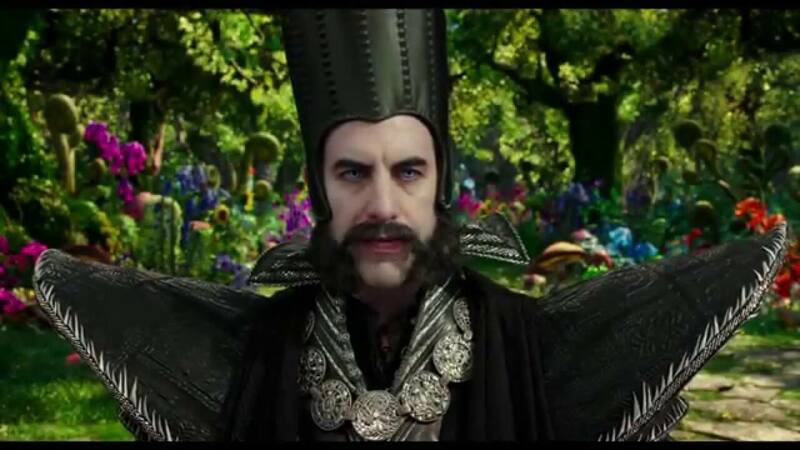 Of course, there are obstacles Alice must face along the way, including a new enemy, Time himself (Sacha Baron Cohen). There were actually a few parts of this plot line that I enjoyed. For example, I loved the idea of going back into the Hatter’s past and seeing how he became his own person. I also was intrigued by seeing the past for the White Queen (Anne Hathaway) and the Queen of Hearts (Helena Bonham Carter). This particular idea of time travel was interesting, and could have been dealt with a lot more than it actually was. 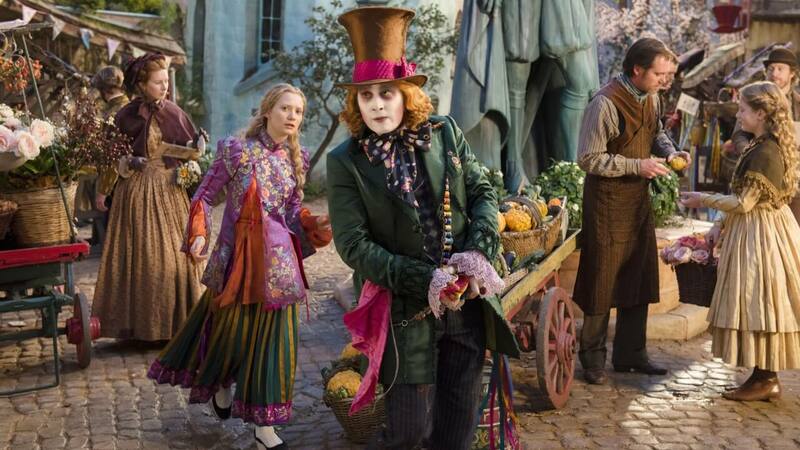 In addition, the interactions between the Hatter and Alice were some of the most compelling moments in the film. When the two are reunited for the first time, I actually teared up a bit. Honestly, the friendship Alice shares with the Hatter is one of the only reasons I made it through the movie at all. This film did have its moments, and for fans of Alice in Wonderland, it did an okay job of showcasing those moments. However, it also has a lot of flaws. The Hatter and Alice have such an endearing friendship, one that almost overshadows the messiness of this story. Through the Looking Glass overall started out quite strong, with Alice returning from her adventure and traveling back to Underland once more. But as the film continued to go on, it seemed to lose a lot of direction. Many of the scenes felt jumbled together like they were moving the plot along a very winding course. Much of the in-between moments seemed mere flashes of images, as everything was going by too fast. It was almost like the entire movie was a race, one that picked up considerable speed as it neared the end. The redeeming moments, such as the interactions between Alice and the Hatter, were few and far between. And one of the most interesting parts of the trailer, the scene where Alice is in the mental institution, was actually so brief that it just felt completely skipped over. Even the ending felt insincere and quick, especially given the entirety of the messy plot. If this storyline were more organized and reflected Lewis Carroll’s world better, it probably would have seen a much better release. Despite the issues with plot, Alice Through the Looking Glass manages to stay afloat due to a few key characters. 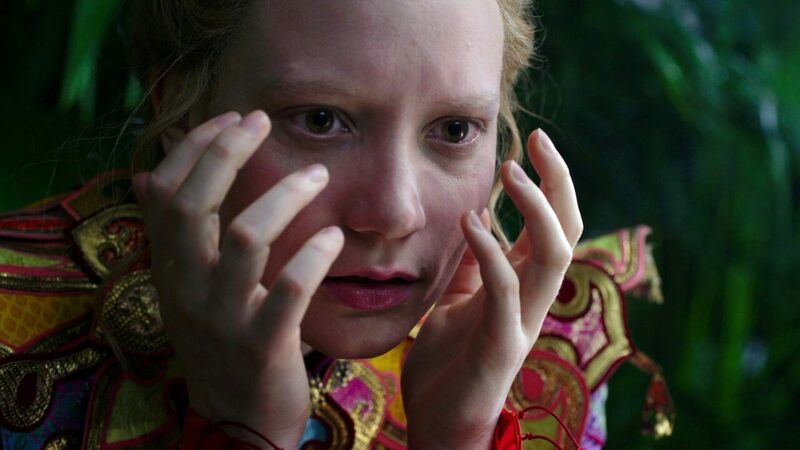 Wasikowska as Alice is brilliant, and Alice has grown into her own in this film. She becomes a strong female role model, standing up to the naysayers even more than in the first movie. And Wasikowska embodies this character with ease, making Alice someone the audience can identify with. The Mad Hatter also provides some quite poignant scenes. Even with the messy storyline, Depp manages to provide a sensational performance. The Hatter and the search for his family are the main reason for Alice’s return, and we are able to see the Hatter grow throughout the course of the film. Sacha Baron Cohen is great as Time, a really compelling new villain. In addition, Sacha Baron Cohen is actually compelling as Time. There were several times during the movie where I actually was able to understand his perspective and even root for him. He was an interesting character that fit right into the fantastical realm of Underland. Sacha Baron Cohen was perfect for this part, bringing just the right amount of wacky and sincerity to Time. Alan Rickman also got his brief moment to shine, but disappointingly had only a few lines. However, Alice Through the Looking Glass pays tribute to him at the end, which was great to see. Unfortunately, many of the other characters were lost in the overwhelming amount of story. While we learn more about the past of the White Queen and Queen of Hearts, both of these characters don’t really seem to change much. This is somewhat contradictory to the idea of their sub-storyline about forgiveness. And the other characters, like the Cheshire Cat or Bayard the dog, are almost completely forgotten. I understand that the story is not necessarily about them – still, it was disappointing to see even less of their characters. The beautiful realm of Underland is still captivating, despite all of the movie’s mistakes. James Bobin paints a colorful portrait for viewers, and it is certainly a delight to watch all of the moving parts. While this is certainly another positive quality about Alice Through the Looking Glass, the CGI does seem to be a bit too much in some scenes. And again, I was rather saddened that the world significantly lost its darker side. Even in its most devastating moments, it does not come close to the work Tim Burton did in Alice in Wonderland, or even to Carroll’s weirdly sinister tale itself. Characters: Alice has really developed into a strong female role model. Time is an interesting and valued addition. The Hatter holds up well. Every other character is lost, what with too much else going on. Cinematography: Really colorful and beautiful to behold, although the CGI can be a bit much. Story: Really the worst thing about this film. Started off an interesting idea with promise, but ends up being a rapid-fire, confusing mess. Interactions between Alice and the Hatter are best part of the movie. 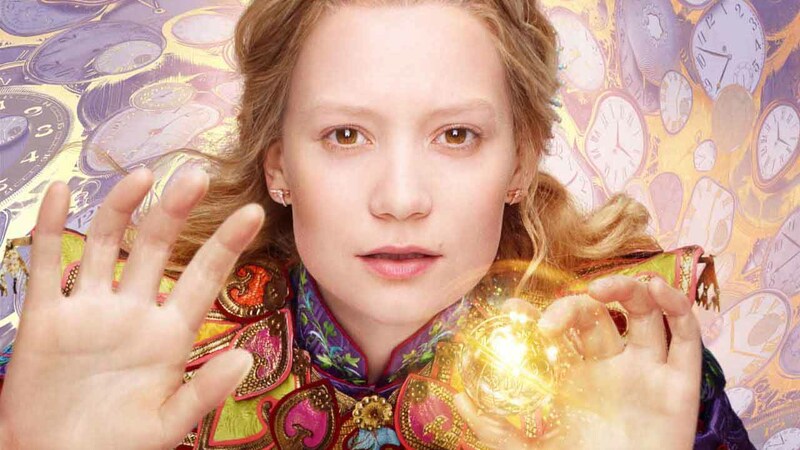 Acting: Mia Wasikowska is brilliant, as is Sacha Baron Cohen. Johnny Depp is in his element here. The other actors perform well, but are somewhat forgotten in the background. Alice returns to the whimsical world of Underland and travels back in time to save her friend, the Mad Hatter.